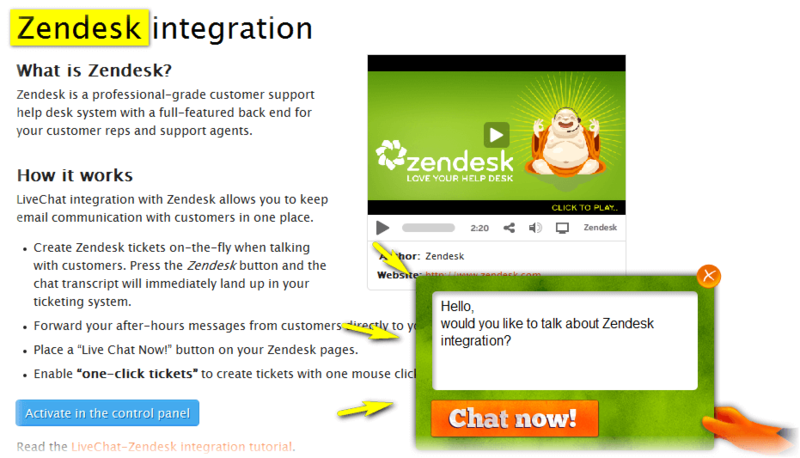 Personalization: One of the most helpful features of LiveChat is its personalization capability. The way your invitation looks like may well decide whether your visitors will start a chat or not. An invitation that doesn’t match your website’s design or is too intrusive may even scare potential clients away! However, an invitation that blends well into your website will greatly improve the overall experience of your visitors and will generate a lot more chats! A fitting example of a customized click-to-chat button by Qhotels. Targeting: When a potential client visits your page and gets an automatic invitation right off the bat without even looking at your product, he is more than likely to turn it down to check your offer first and you may miss your chance to have a chat with him. By smart utilization of triggers engaging your client in a chat can be much more successful. For example, instead of a general invitation that would be the same for every page you could have a group of product-specific invitations that would vary according to the kind of product your clients are looking at. Varried invitations make your live chat more personalized! Have your invitations trigger at specific product pages to help your clients choose what they are looking for and increase your chance of making a sale! Place your button in a place that is bound to attract attention! Placement: The placement of either your triggered invitation or your click-to-chat button is also of great importance to your invite-to -hat ratio. You should make sure that those invitations are easily visible and can be found in the same place when browsing through your website. The automatic invitation popping up in the middle of the screen may get your client’s attention instantly, however, it may also be annoying. If you have short trigger times, it may be wise to place it somewhere else, e.g. on the side of the screen. The client would be able to continue to browse through the page while still having the option to answer the invitation at any time. 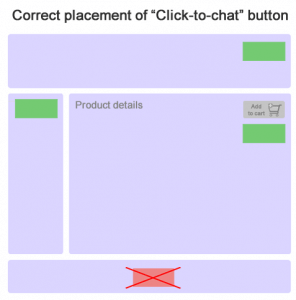 Your click-to-chat button should be placed in an easily accessible place of your site, you don’t want it to be on the very bottom of your page, or in a spot where it is hard to notice. Make sure it stands out enough that whenever your visitor is looking for it, it’s found right away.